1. 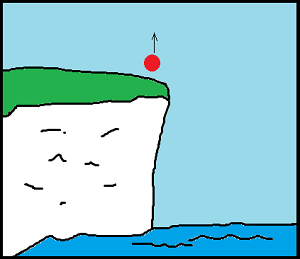 A ball is thrown vertically up from the edge of a 100m high cliff with a velocity of 5ms-1. Calculate the time taken for it to hit the bottom of the cliff.2. A ball is rolled up an inclined plane at a velocity of 2ms-1. If the angle of the plane to the horizontal is 10°calculatea. The component of acceleration down the slopeb. The time taken for the ball to return to it’s original position.